Still as atmospheric and impressively grim as it was last year, but inessential if you have the original. 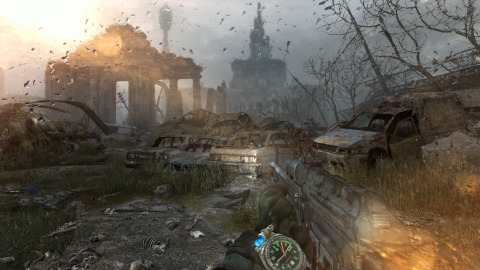 The reworked version of Metro 2033 in Metro: Last Light's far superior engine makes perfect sense. It offered a chance for 4A Games to go back and fix a ton of things that have been bugging them. To act on lessons learnt from their mistakes the first time round. The Redux version of Last Light is pretty much the same game as last year. And so, here we are. Facing a re-release of a game little more than a year old. A re-release that offers little extra to PC gamers whose rigs were up to the task of running it the first time, that looks almost identical to the version you played last May. In fact, where Metro 2033 Redux is a lovingly improved version of the original, Metro Last Light Redux is little more than a GOTY version. It includes every piece of DLC released to date and some of the additional weapons have been integrated into the single player story. Visually the games are practically the same. I played the original and the Redux version alternately, chapter by chapter, and found it easy to forget which version I was playing at any given moment. Not to say that Metro Last Light Redux is bad looking. As I say, the original is less than a year old, so it's still a fantastic-looking game. Which is why it doesn't need a remaster. With so much special attention given to Metro 2033 Redux however, Last Light Redux isn't nearly as essential by comparison. Which is fitting, since it's also the worse game of the two. It's a fine shooter, but fans of the original's survival horror feel were disappointed by the sequel's focus on bombastic combat and boss fights over survival and atmosphere. A new "Survivor" mode does its best to recreate that feel of Metro 2033 by making ammo more scarce and enemies more aggressive, but it feels little more than an attempt at a quick fix solution. Your mileage may vary on this. Some of you may prefer Last Light's feel. For those that want it, there's a new "Spartan" mode available in Metro 2033 Redux which emulates Last Light's combat system. Be aware that I will judge you for using it. It makes sense for Metro Last Light Redux to exist on consoles, with locked 60fps framerate and higher resolution being the main selling points. Obviously this doesn't really impact PC owners. If you've not played Last Light before then Redux is worth picking up. It saves you some money over the original version, but if you already own the game there's very little to draw you back and buy it again. Unless you really want another set of Steam achievements.